George E. Bye. CEO and founder of Bye Aerospace, is on a roll these days, selling a large number of SunFlyer 2 training aircraft, delivering Silent Falcon solar electric unmanned aerial vehicles (UAVs), partnering in the TriFan 600 project with XTI Aircraft, and overseeing the first flight of the StratoAirNet prototype. 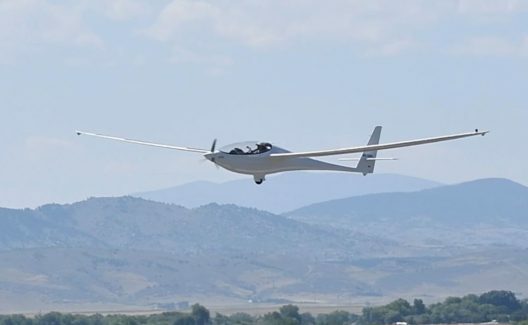 A letter from Diane Simard, Senior Vice President of Bye Aerospace, Inc., reports “the successful completion of the first flight of the solar electric technology demonstrator prototype for its “StratoAirNet” and “Solesa” families of medium-altitude aircraft systems.” Flying from the Northern Colorado Regional Airport, north of Loveland, the sailplane-based optionally-piloted vehicle has made additional flights since its maiden outing. Two forms of this long-endurance flight approach are on the horizon. Both systems will provide support for extended “…endurance commercial and government security requirements, including patrol, observation, utility, mapping, precision agriculture, search and rescue and surveillance missions,” according to the company. The Solesa aircraft system will be piloted, performing patrol and survey missions for shorter flight durations. It will find use as an R&D test platform for new customer payloads. 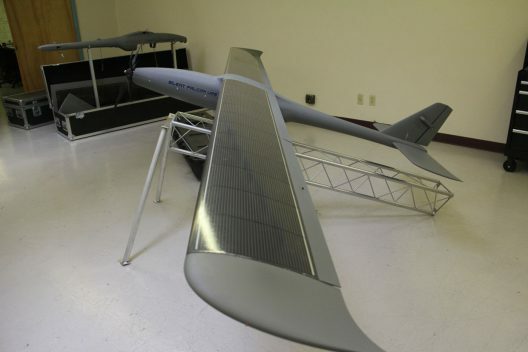 StratoAirNet will fly longer-endurance UAV missions following required steps before going on to even longer and more arduous tasks or carrying newly installed systems. 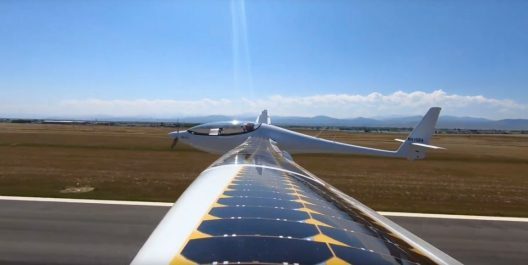 SolAero’s solar cells, both four-junction and triple-junction designs, can operate at up to 32-percent efficiency and produce up to 150 Watts per kilogram. Terrestrial models can achieve up to 39-percent efficiency. Previous post: Liquid Batteries for Aircraft?